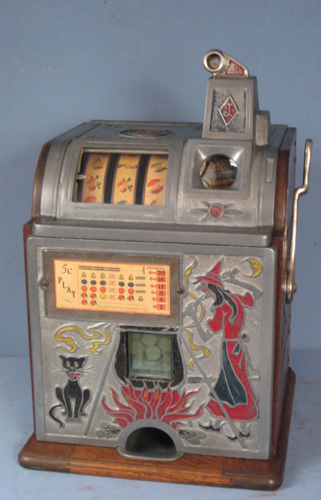 Really neat Jennings Golden Buddha "Galaxy" model console slot machine from the early 1970's. It's a one cent machine. It's an electro mechanical operating machine. It's got a hopper payout. The machine is in need of some TLC. The mech cycles nicely but the escalator is jammed. I have not tried to plug it in. Sorry no keys for the bottom door that reveals the hopper mech or for the top front door that is currently opened. All locks are present. 53" High by 17" Deep by 16" wide. $349.00!!! The machine is available for pick up only in Rockland County, NY.